away at some point after the game. 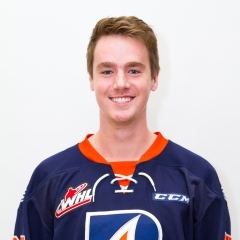 )It was his first career two-goal game and his second three-point outing.“Joe Gatenby was probably our best player,” Kamloops head coach Don Hay said after his side had torched the short-staffed Rockets — they dressed 15 skaters — for six power-play goals on 10 opportunities. (You’re right . . . it’s not a good idea to give up 10 PP chances when you’ve only got 15 skaters dressed.)Anyway . . . “We were fortunate that we were able to capitalize on our power play early,” said Gatenby, a Kelowna native whose first goal came with the man advantage. Gatenby’s second goal was credited to freshman F Scott Mahovlich, but was switched during the second intermission.“I felt kind of bad about that,” said Gatenby, knowing that it would have been Mahovlich’s first WHL goal. “I’m not sure about really what happened there.”What happened is that the Rockets were having one of those nights. In this case, G Brodan Salmon, while being pressured, reached out with his stick to pull the puck underneath him. However, the puck went right underneath him and into the net. The goal was given to Mahovlich, who was the closest Kamloops player to the puck at the time. However, the official scorekeeper reviewed the play and the goal was given to Gatenby, because he had been the last of the Blazers to touch the puck.“I didn’t know what happened,” Gatenby said with a chuckle.Gatenby was acquired by the Blazers in the hopes that he would give them a strong defensive game and eat up a lot of the minutes that came available with the graduation of Ryan Rehill, who played a regular shift and also was a stalwart on the power-play and penalty-killing units. So far, so good.“I’m really enjoying my time,” Gatenby said. “I really like my teammates and the coaching staff has been really good and really easy to work with.”And don’t look now but he’s tied for the WHL lead in goals and points, as the Blazers go into Kelowna for a Saturday night rematch.“I’m really good friends with pretty much the whole team,” Gatenby said as he looked ahead to tonight. “I’m focused on the Blazers right now but I know how tough it is (to lose like that). We also had a lot of fortunate power plays. They’re going to bring more to the rink tomorrow.”—— The Vancouver Giants announced late Friday night that they have acquired F Taden Rattie, 18, from the Red Deer Rebels for a sixth-round pick in the 2017 bantam draft. . . . Rattie, from Airdrie, Alta., is the younger brother of former Portland Winterhawks sniper Ty Rattie. . . . Taden, 6-foot-4 and 190 pounds, had one goal in 25 games with the Rebels last season. He is expected to join the Giants in time to play tonight against the host Everett Silvertips. . . . Everett beat the Giants, 7-3, in Langley on Friday night. . . . The Rebels had acquired the younger Rattie from Portland on Dec. 28 for a fourth-round pick in the 2016 draft. He never did play for the Winterhawks; in fact, he had committed to Western Michigan before he chose to join the Rebels. At Langley, B.C., F Graham Millar and F Devon Skoleski each scored twice to help the Everett Silvertips to a 7-3 victory over the Vancouver Giants. . . . Everett, which according to the prognosticators will have trouble scoring goals, struck four times in the game’s first 11:27. . . . F Matt Fonteyne had three assists for Everett, while D Jake Christiansen had a goal and an assist. D Lucas Skrumeda and F Patrick Bajkov helped out with two assists. . . . The Giants got two goals from F Dawson Holt and two assists from F Johnny Wesley. . . . Everett G Mario Petit stopped 20 shots, while Vancouver’s Ryan Kubic turned aside 26. . . . The Silvertips were 2-4 on the PP; the Giants were 0-3. . . . Vancouver D Matt Barberis left in the second period and didn’t return. . . . This was the first regular-season game for the Vancouver tandem of general manager Glen Hanlon and head coach Jason McKee. Hanlon replaced Scott Bonner, who had been the only GM in franchise history before moving to The Sports Corporation as a player agent. McKee takes over from Lorne Molleken, who was fired with a couple of games left in the 2015-16 season. McKee, 37, had been with the AJHL’s Spruce Grove Saints for 10 seasons, the past seven as GM/head coach. . . . It was the Giants’ first regular-season game of this season in their new home, the Langley Events Centre. They had called Pacific Coliseum home since arriving for the 2001-02 season. . . . Announced attendance: 4,875.——At Victoria, F Colby McAuley scored twice to lead the Prince George Cougars to a 3-1 victory over the Royals. . . . The Cougars also got a big game from their penalty killers, who were 9-for-9. . . . D Max Martin gave the Cougars a 1-0 lead at 6:53 and McAuley upped it to 2-0 at 9:49. . . . F Ty Westgard cut into the lead at 15:03 of the second, but the Cougars were able to hang on until McAuley got an empty-netter at 19:03 of the third. . . . F Kody McDonald had two assists for the visitors. . . . The Cougars got 30 saves from G Ty Edmonds, while Victoria’s Griffen Outhouse stopped 17 shots. . . . Prince George was 0-4 on the PP. . . . The Royals were without F Carter Folk, 20, as he served Game 3 of a five-game suspension he incurred during the exhibition season. . . . Cougars head coach Richard Matvichuk picked up his first victory in his first regular-season game. He replaced Mark Holick, who parted company with the Cougars with a year left on his contract and now is coaching in Italy. . . . Announced attendance: 6,539. Swift Current at Saskatoon, 2:05 p.m.Tri-City at Portland, 5 p.m.